Through University League, You Can Make a Difference! The University League, a non-profit membership organization founded in 1901, has a long history of supporting UW–Madison students. Since 1985 the League has given more than $1,000,000 in scholarship funding and gifts to UW related organizations. The purpose of the League is to raise funds for student scholarships and to promote volunteer services, educational opportunities and social activities for its members. For many decades, University League members have provided generous scholarship support to UW–Madison students. Funds come from the proceeds of the annual Stay at Home Scholarship Benefit, general donations, memorial and honorary donations and endowed scholarships. The University League has 29 funded Named Endowed Scholarships with a book value of more than $2,000,000. In 2017–18 University League disbursed $110,259 in spendable income from 25 of the 29 endowed scholarships through the University of Wisconsin Foundation. In 2017–18, the University League awarded $35,600 in general scholarships and gifts. This includes $1800 to each of the 11 University of Wisconsin–Madison schools and colleges. The $12,800 UL Memorial Scholarship was given to the UW College of Letters and Science. Additionally, $3000 was donated to University of Wisconsin–Madison affiliated organizations. The University League’s scholarship and gift program is outstanding among Big Ten Women’s Organizations. In 2018 The University League awarded $142,859 in Endowed, General and Memorial Scholarships. There are several ways in which League members and others may participate in funding scholarships and gifts. 1. 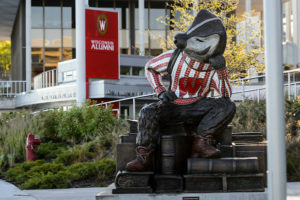 General Scholarship Fund—These funds are awarded to 12 UW-Madison Schools and Colleges for scholarships. Any balance remaining in the operating budget at the end of the year is added to the General Scholarship and Gifts Fund. by contributing to fundraising projects such as the Stay-at-Home Scholarship Benefit. Donate $25,000 (or more) to immediately fund and establish the scholarship. Donors may set up an installment plan to take up to 5 years to contribute the $25,000 required to establish the scholarship. Earnings from partially funded endowments are deposited to the University League Endowed Scholarship Fund. The spendable endowment income is used annually for scholarships. When the NES total contribution reaches $25,000 an NES may be established in the person’s name or In Memory Of (IMO) or In Honor Of (IHO) an individual. Named Endowed Scholarships that allow online contributions are linked below. By clicking on the name of the endowed scholarship, you will be redirected to the University Foundation Make a Gift site.